It's officially winter. After a strangely warm December we are now firmly entrenched in January's chill. The days are short, it gets dark early, and our window to play outside is small. So it's time to find some fun ways to keep the kids entertained indoors. During a particularly cold, rainy week where we were stuck inside fighting colds and climbing the walls, I pulled together a flashlight fort for my boys. 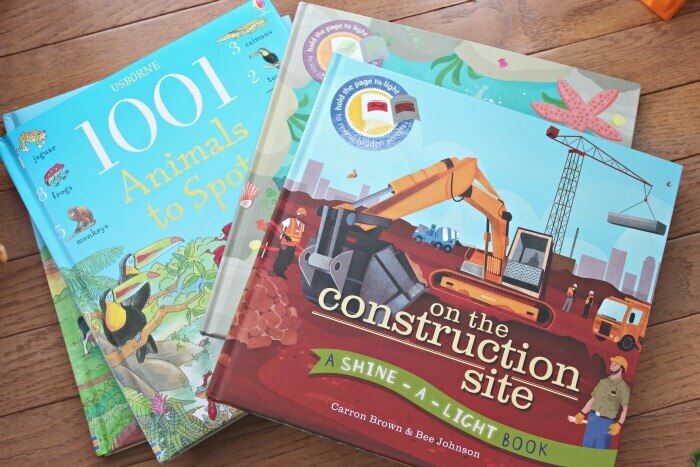 It's super easy to put together, entertains the kids forever, and gets them reading - perfect for us! 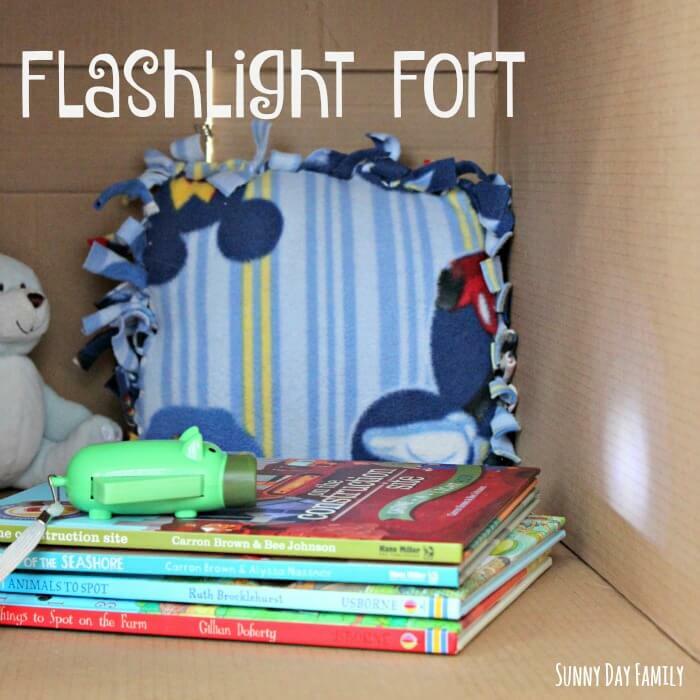 The Flashlight Fort was inspired by two of our favorite Christmas presents - flashlights for the boys and my new carpet steam cleaner. I was getting ready to recycle the giant box from my steam cleaner when I thought it would make the perfect fort for the boys. And since they love their new flashlights, why not combine the two? 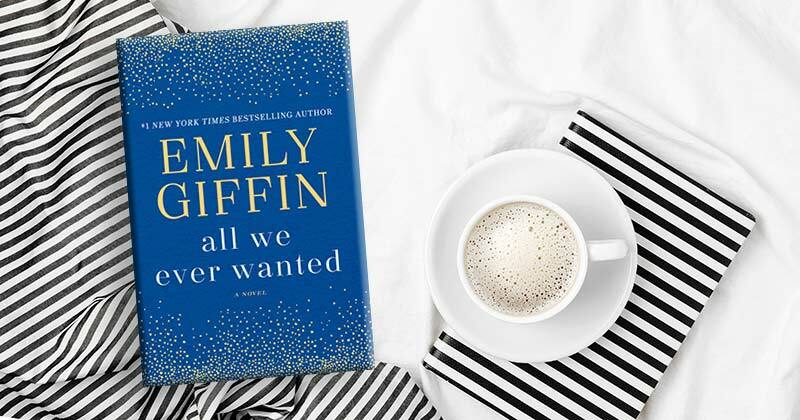 The days have been so dreary that cuddling up in a cozy fort sounds awesome. I put the big box on its side, added a pillow and a cuddly friend, a flashlight, and a stack of our favorite discovery books. 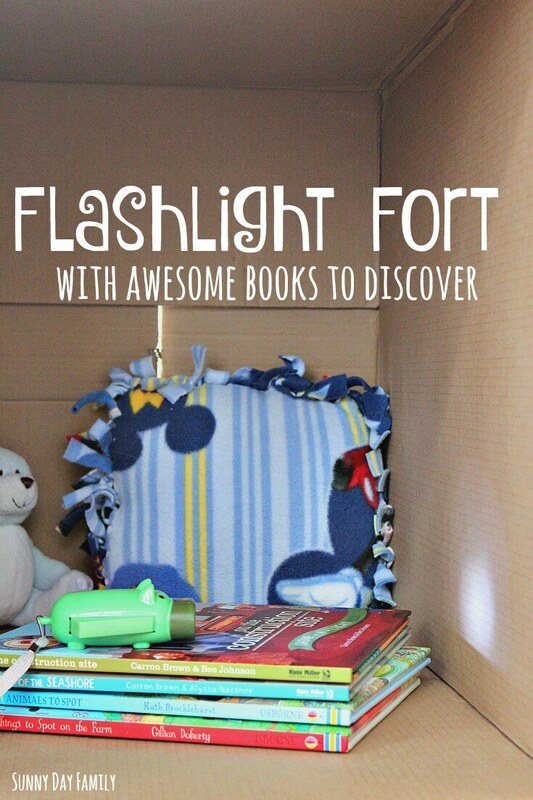 These books are perfect for the flashlight fort. 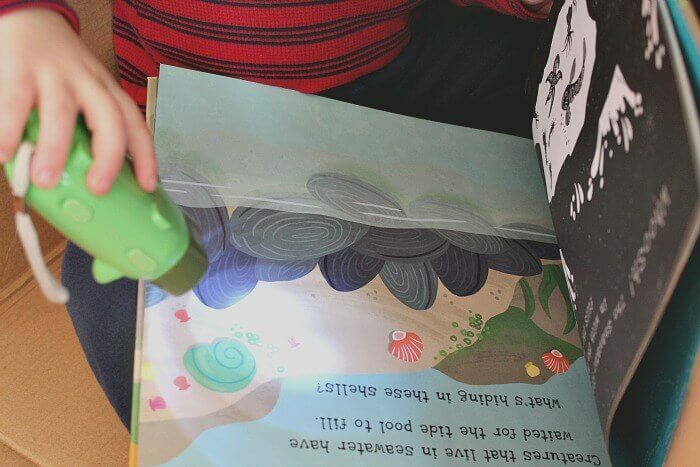 I call these our discovery books because they invite the boys to look and find different elements on each page - and in the fort, they can use their flashlights to do it! 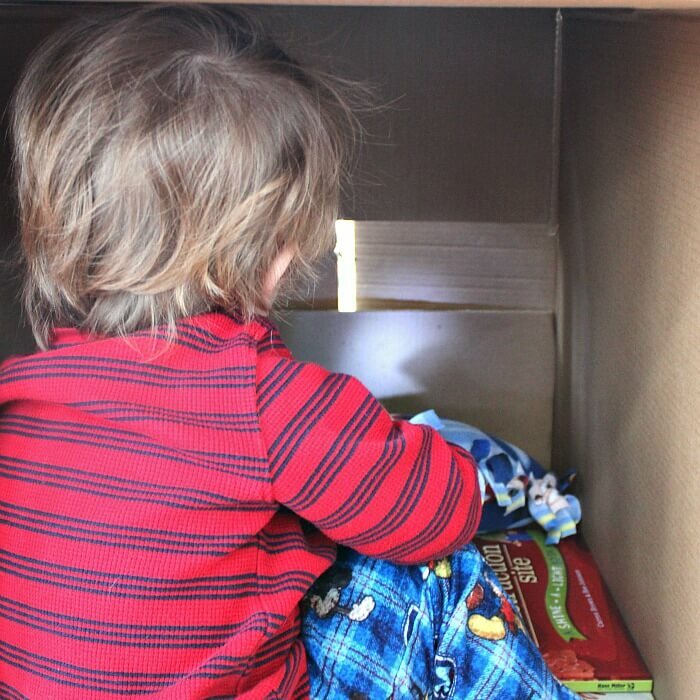 I filled our fort with our favorite Shine a Light and 1001 Things to Spot books and let the boys explore. They loved it! The first thing to do was to shine their flashlights all over the walls and ceiling of their new fort. They are fascinated with shadows and light right now so this was entertaining enough for a while. Then they settled in with their books. 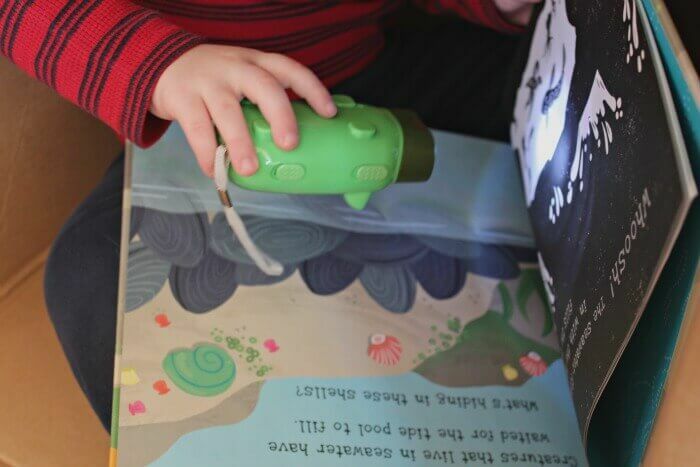 The Shine a Light books are especially perfect for a flashlight fort. Each page holds a special surprise that can only be uncovered when you shine your flashlight underneath. We have Secrets of the Seashore and On the Construction Site and the boys are just fascinated by the cool hidden photos. I'm thinking of adding to our collection with Secrets of Winter for my animal lover and On the Train for my transportation guy. We love the 1001 Things to Spot books too. They are awesome for counting practice and adding the flashlight makes them even more fun. We have 1001 Animals to Spot and 1001 Things to Spot on the Farm and I think 1001 Pirate Things to Spot is next on our list. Or grab one of these fun Play Tents: I love the castle or the awesome club house. 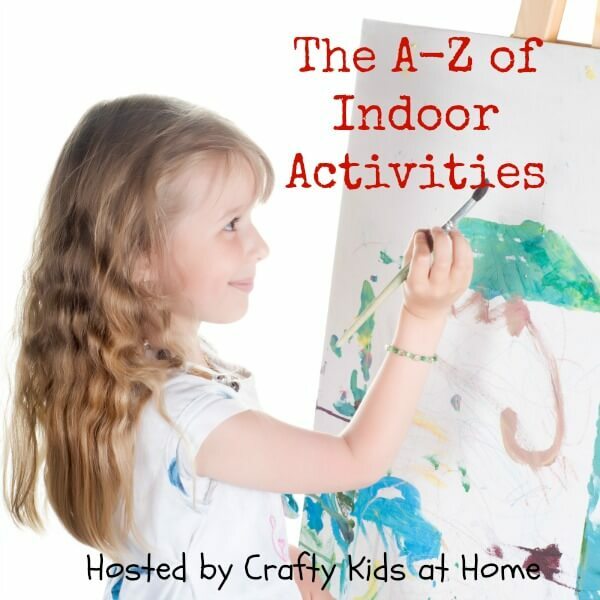 We're sharing this activity today as part of The A-Z of Indoor Activities blog hop hosted by Crafty Kids at Home! Find it and 25 more indoor boredom busters here. Something about flashlights makes everything more fun! This is such a great rainy day idea!